First hint of summer and we're all looking to get outside. And obviously it'd be nice to combine that with a big, old fry-up too. 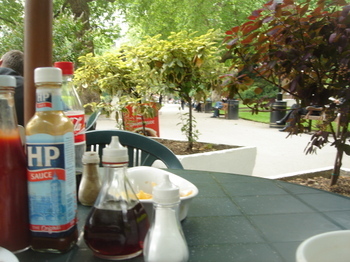 So can I recommend the Embankment cafe for all your outdoorsy, ebcb needs? It's not cheap, it's too good a location to be cheap, but it's worth it to get some bucolic accompaniment to yout full english. I wasn't allowed to order an ebcb (ah, rules) but the Full English is just ebcb plus sausage and toast so I compromised. And it was worth it. That egg seems to benefit from the fresh air, its laying back, spreading out, catching some rays. The beans are clearly more indoory types, they're cowering behind the chips, slapping on some beanjuice as a kind of suncream. The chips are pale and crisp, which doesn't really fit with the suntan analogy so forget it. 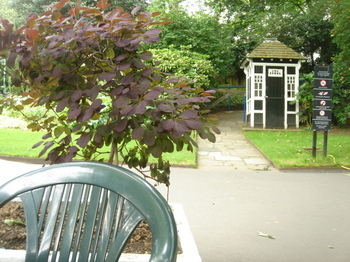 It's not the usual outdoor place - a couple of tables squeezed onto a bit of pavement next to a traffic jam - it's in a litle mini park, with only a major road and a huge hedge/fence separating you from the river. All condiments present and correct. The sweetest little shed, like the one Grandfather Potts gets captured in by Baron Bombast. A splendid place to pass the time. There's a platial map here. Firstly, Congratulations on a wonderful site. Secondly, did you happen to see whether or not this little place is open on Sat? This is such a brilliant site! Hey, I'm passing through London on my way from here in NZ to my folks place in Scotland. On the day I arrive at Heathrow in the morning I have to travel to Euston to get a train at 2pm. 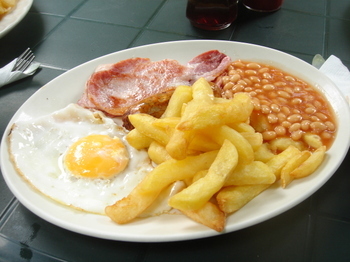 Can you recommend a good EBCB place near Euston? PS If you can email me at duncan (at) cleat DOT net DOT nz, that would be greatly appreciated. I'm not sure I know anywhere near Euston, but I'm sure other people might - anyone got any suggestions? 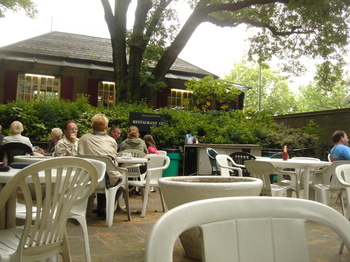 I'm not sure if the Embankment cafe is open on Saturdays. I suspect it is. But I might be down there again soon, I'll check. What day are you arriving in London. Will it be a weekday ? What time will you arrive at Heathrow ? Let me know and I'll give you a few suggestions. There are a few scruffy places near Euston, that aren't really worth the effort. If you've got time, you should visit somewhere better, maybe a few tube stops away from Euston. Have you ever been to the Hambone Cafe in London's Docklands? I'm planning to go there tomorrow. Will be taking a nice dose of hayfever/allergy tablets! I will let you know if it's open. mmm egcb's..or the closest offer. Good choice Russell, I went there yesterday. They also have a lot of what they call "traditional Italian food", which is nice too. Good, strong tea. 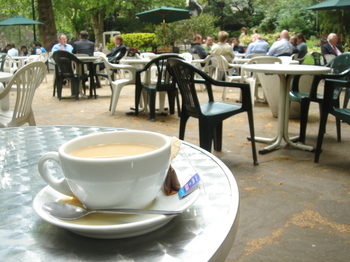 Be warned, the park is full of plane trees - the ones with the evil fluffy brown pollen seed pods that make you sneeze even if you're not normally a hayfever sufferer..
Oops, sorry, I meant to say that about the cafe in Russel Sq. But those evil trees are everywhere! Love this post - the suntan analogy made me laugh out loud. Can't wait to get over there to try these places! working here as bar staff ? 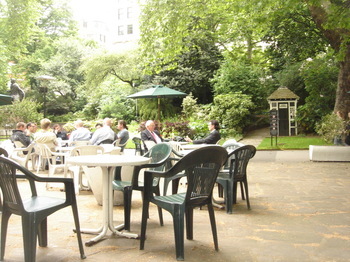 "There are a few scruffy places near Euston, that aren't really worth the effort." Can I just stick up for Euston? There's the Golden Tulip on Phoenix Road.